Now let me state right from the start in the interest of full disclosure by making it clear that I am no Lebron James (the basketball player) fan. I'll admit that I'm a hater. Lebron may go down one day as the GOAT, but as far as I'm concerned, he has only won ONE ring because Dwyane Wade was holding his hand when he won the other two. See, that's the level of hate that I'm on. 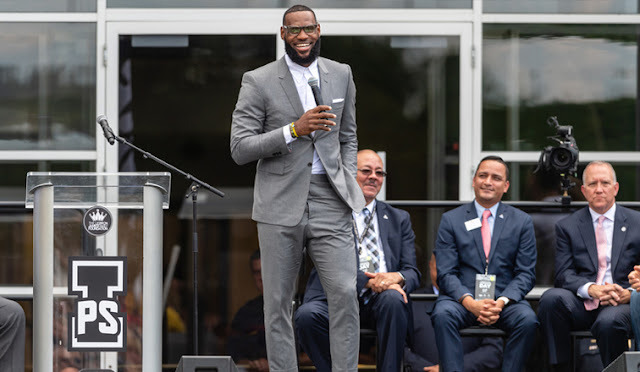 But even a Lebron hater like myself has no choice but to give accolades to Lebron James (The Man) for opening up the I Promise School in Akron, Ohio. But apparently, there are those cynics among us who while they give credit for the opening of the school question James motives for doing it. Reason #1: Lebron doesn't care about taxes. I don't think Lebron is worried about taxes if he was he wouldn't be headed to California with its high taxes nor would he have left Florida where there is no personal income tax. Yeah he wouldn't have won another ring, but he would have saved millions. Reason #2: There are easier ways to get a tax break. L.B. could have just got together with some educational types and opened a charter school and be done with it, but he didn't do that. The I Promise School is not a charter but a traditional school that is part of the Akron Public School system that means he has to deal with the local teacher's union and the school board. The school takes in at-risk students which means that issues like hunger, emotional problems, and homelessness must be dealt with. That's a lot for someone trying to get a tax write off. Reason #3: This is a very personal thing for Lebron James. If you have heard any of the interviews with James he doesn't give anecdotal evidence or point to studies to show why he is doing what he does for these students. He looks to his personal experiences as a young kid in Akron. When asked about why the school offered free breakfast and lunch James didn't start off by saying talking about what some study showed, he talked about how he couldn't focus when he was hungry. Those memories drive this young man to help other. so they don't have to go through the hunger and homelessness that he dealt with as a child. Have we become so jaded that we can't understand why a man would do good to help others? Have we become so cynical that we can't understand that a child who suffered grew into a man that wants to stop others from hurting? If you have become that cynical and jaded then the problem is with you and not Lebron James. Well I for one haven't, and I appreciate what Lebron James is doing for the children of his community. Lebron may not finish with as many championships as other great NBA players, but he'll be in an exclusive class of great human beings with Muhammad Ali, Jackie Robinson, and Bill Russell. George l.cook just want to thank for enlightening us, we need more examples of humanity. and thank you LeBron james.